This is a copy of records I kept during 2008. Last update was 4/19/08. 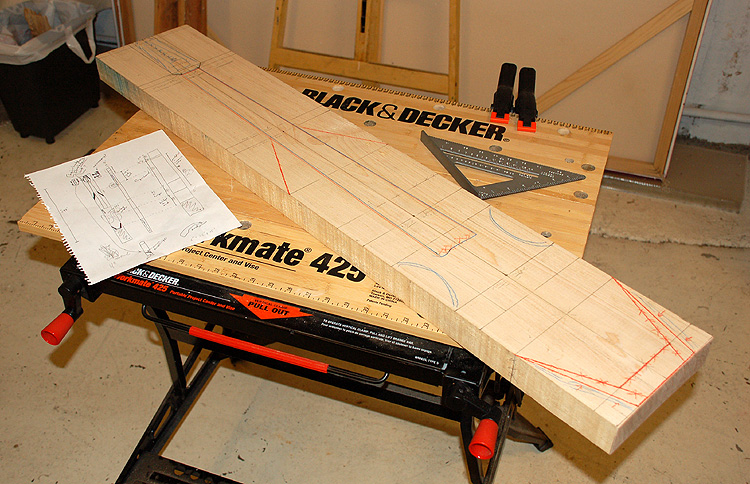 Note: a couple of the photos show drawings with measurements. I do not have those anymore. I don’t know what happened to them. This is the fourth electric cello I’ve made. 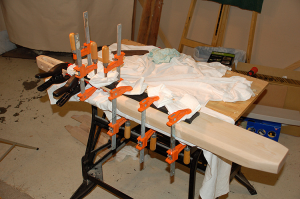 I did the others several years ago and it’s been a while since I’ve broken out the hand tools. I’m making this one to 1) try to address issues that I never quite resolved with the others, and 2) save myself some money. After scrawling out a few semi-coherent sketeches, I got a board of rock maple at MacBeath Hardwoods in Berkeley CA and made some rough measurements. After rough carving. 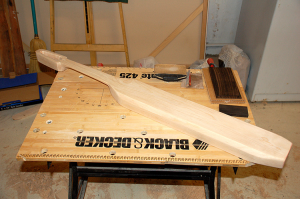 I cut the basic shape with a circular saw and a handheld jigsaw, trimmed up the sides with a ryoba saw and a hand shaver, and shaped the neck, headstock, and body with bench chisels, some rasps, and more hand shaver action. The body as measured was way too heavy, so I narrowed it considerably. The back of the body. At this point, the whole thing is sanded up to 220 grit, after 80 and 150 grit. 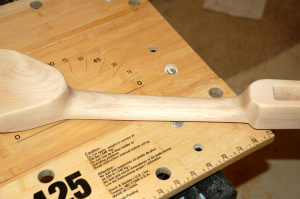 The neck heel and thumb heel. 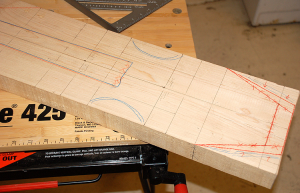 They’re not entirely symmetrical and neither is the headstock but I’m not going to worry about it too much because it should be playable as is. Below: fingerboard clamped to body after gluing. 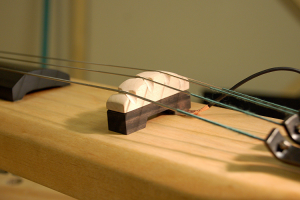 The fingerboard is made of graphite. I got it from Moses Grapite in Eugene OR. I haven’t decided if I like graphite or not. At least I think it’s graphite – maybe it’s carbon fiber. Maybe they’re the same thing. 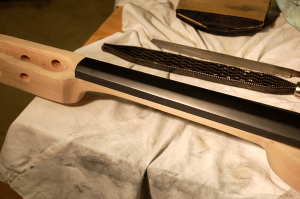 Whatever it is, it carves well and behaves much like ebony, but when sanded, it leaves gray gunk all over everything that’s tough to remove, especially from wood. I don’t know if graphite is toxic or not, so when I carve or sand it, I wear a respirator, goggles, and gloves. 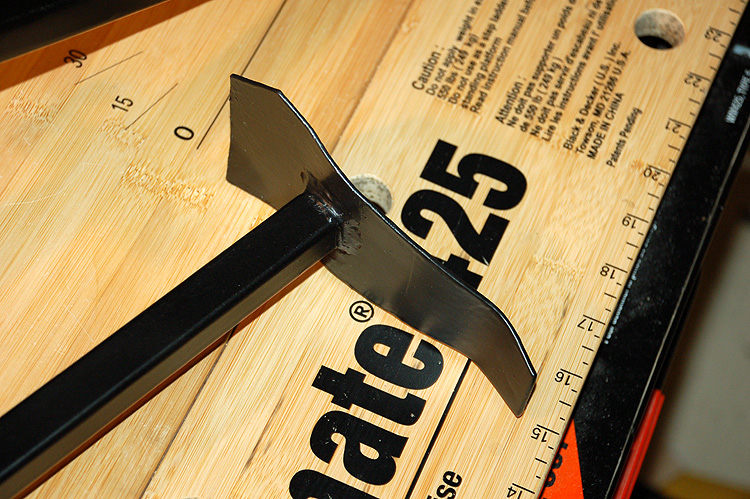 I prefer Titebond for wood glue, and fortuitously, Moses recommends it for gluing their graphite (carbon fiber?) products. I like Titebond II for fingerboards, because it has a shorter set time than the original flavor. 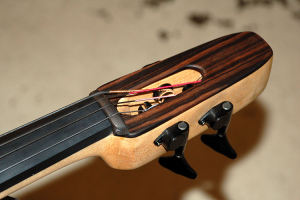 I drilled the tuner holes in the headstock with a 1/2-inch bit and reamed them out a little to acommodate Gotoh bass tuning machines. The holes are on a diagonal so that the strings can reach the tuning posts from the nut (which will sit at the top end of the fingerboard) without bumping in to anything inbetween. 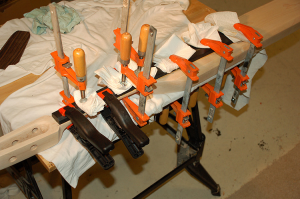 I should have clamped every two inches or so but that’s all the clamps I have. 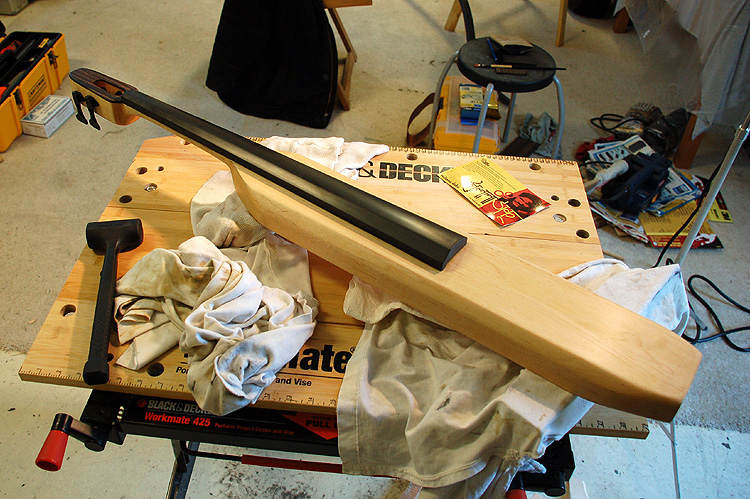 “Bass” side after filing and sanding the neck flush with the fingerboard. “Treble” side before filing and sanding. 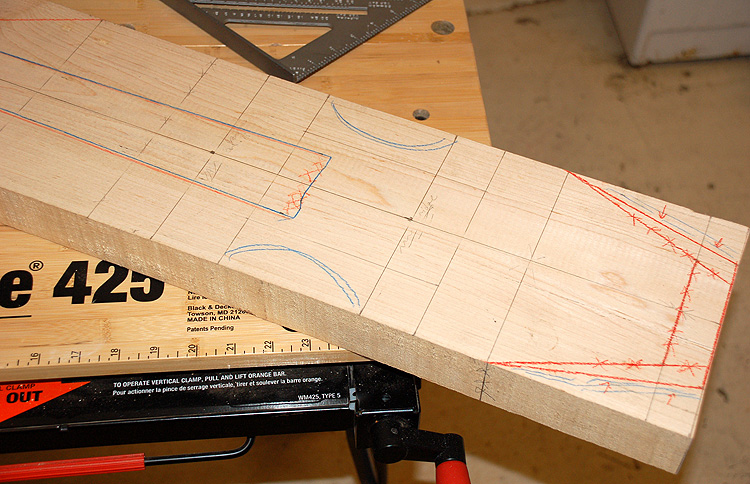 I deliberately cut the neck a little too wide so that it would trim up flush with the fingerboard. “Treble” side after filing and sanding. 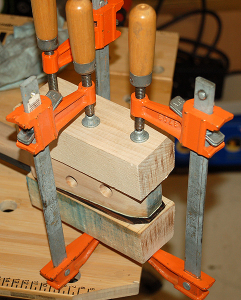 Headstock veneer, glued and clamped. The veneer is Macassar ebony, which is easier to get than Madagascar ebony, which has a more uniform dark-brown color. I got the veneer wood from Luthiers Mercantile International in Windsor CA. I trimmed the veneer with a dozuki saw and then filed and sanded it flush. Since I don’t own a router, I cut the hole in the middle by drilling at the top and the bottom, cutting between the holes with a jewelers saw, and then cutting and filing until the sides were reasonably straight and the top and bottom curves matched. Ebony is good for that sort of thing. A lot skipped here: installation of Gotoh bass tuners, finishing of the body (see below). I sanded the body from 200 grit to 400 and then 600 grit. 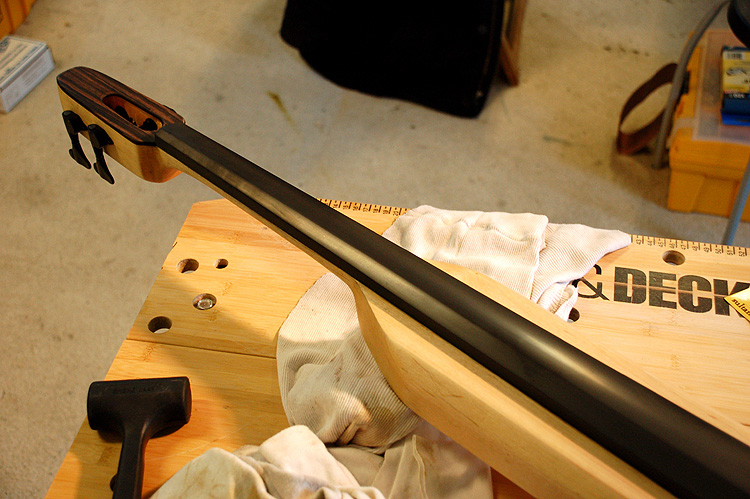 Then: three thin coats of shellac with an amber stain, sand at 600 grit between and after the final coat. 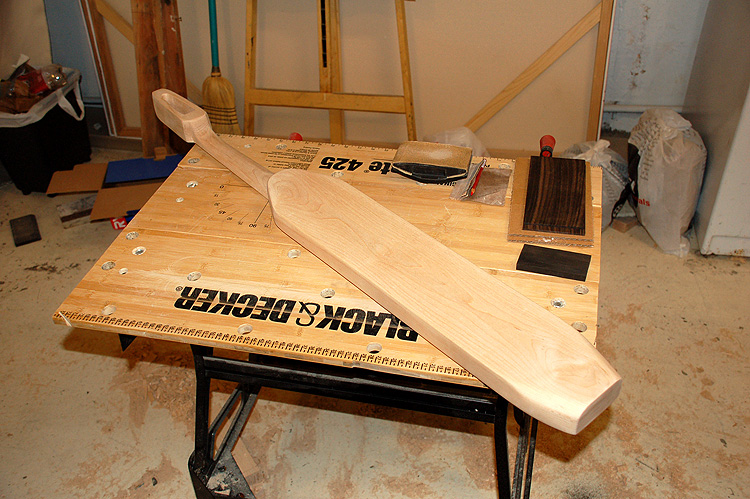 Then: two thin coats of tung oil, rub the first coat down with a cloth. Final coat of tung oil -> dry -> sand with 1200 and then 1880-grit micromesh. The camera doesn’t really pick this up, but the body now has a very light amber/honey color. March 14, 2008: rough fit. 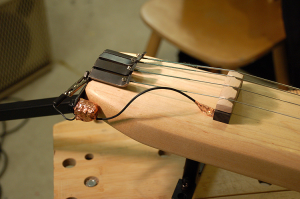 Last night, I strung up the cello with the tailpiece, a bridge borrowed from one of my previous instruments, a makeshift piezo transducer pickup, and the rough-carved nut. 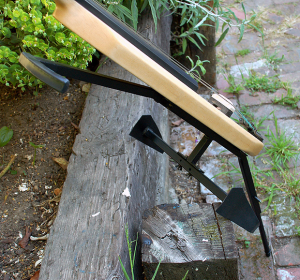 Shown below are the tailpiece, bridge, and pickup. The tailpiece is TIG-welded plain steel. Originally, I had the strings mounted through the holes in the bottom piece, but I didn’t like the angle of the strings from the bridge, so I welded the brackets on and bent them with pliers so that the angle of the mounting holes wouldn’t strain the strings too much. 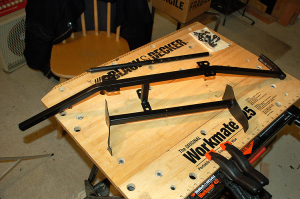 I might replace the 7mm hex bolt with something more elegant, and I’ll probably either paint the taipiece or use some sort of blackener on it. The 1/4″ jack is attached to the extension at the bottom to provide some grounding for the transducer pickup. The copper-wrapped tab under the bridge is a thin film of piezoelectric material wrapped in copper tape, which can be found in most gardening sections of hardware stores, because snails and slugs don’t like copper. The piezoelectric material responds to the vibration of the bridge with small changes in the electrical field it’s part of. An amplifier can convert these small fluctuations into sound. One big problem with piezo pickups is noise. Some people say that shielding the circuit doesn’t help much, but I’ve found that it does somewhat, although piezo noise tends to be more from lack of a proper ground than from lighting fixtures and such. The noise is akin to a low-frequency hum that sounds to me like it’s DC current that has no way to leave the circuit. Isolating the piezo side of the circuit with a transformer unit usually helps. A DI (direct box) can be used for that purpose. So can a preamp unit. Some preamps seem to act as buffers that eliminate piezo hum noise even if you run a 1/4-inch unbalanced output instead of an XLR (balanced a.k.a. properly-grounded) output. But not all do, so you have try different things. A DI, however, is probably a better bet for ground loop suppression. Grounding the piezo to piece of metal, like I did here, helps a tiny bit, but that’s still a floating ground, not an “earth” ground, and is effective really only when the player is touching the strings, which in turn touch the tailpiece, which in turn touches the piezo circuit. In other words, the player is the ground. Update 4-19-2008: Contrary to previous: shielding does seem to make a big difference, at least with the MSI piezo tab I used for this project. 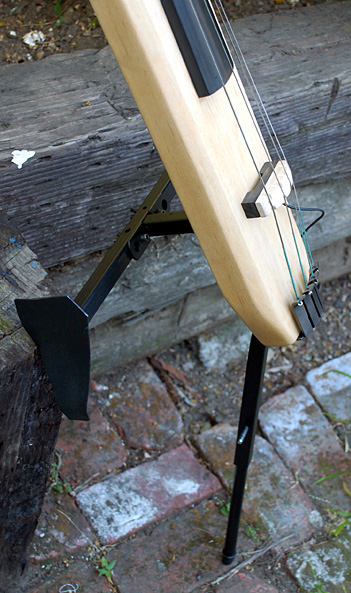 Grounding through the instrument to the player doesn’t make much difference. DI ground loop isolation is more effective. Doesn’t mean it’s applicable to all piezos, though – Fishman pickups are different. Another big problem with piezo pickups is that they can sound tinny and weak. That’s often because of impedance mismatches. Piezo pickups have extremely high impedance (AC resistance, denoted by Z) in Megohms, and when they’re plugged into an ordinary guitar or bass amplifier, they can sound screechy, because most guitar/bass amps aren’t designed to handle inputs with impedances that high. Z matching can be done with a direct box in many cases. I’ve been using a passive DI in tandem with a preamp unit – more about that below. A piezo transducer pretty much begs for a preamp of some sort, especially if you’re going to be using a cable more than a meter long. A number of preamp units offer very high input Z (4 to 10 MOhms), and output Z matched more to an amp or a board. In addition, many preamp units have both an instrument-level 1/4″ output (Z ~= 100k to 220k Ohms, sometimes balanced, sometimes not), and an XLR output (Z ~= 600 Ohms) for direct connection to a mixing board. 1. Cello into SansAmp Para DI preamp (Z ~= 4.7 MOhms, seems to be perfect for this pickup). 2. XLR out from Para DI into the XLR output of a Radial passive DI box (600 Ohms to 600 Ohms). 3. 1/4″ input from DI into a Roland DB-700 bass combo amplifier (100kOhms to amp). ***Note that the DI box is wired “backwards.” This is known as reamping the input signal. Although I could just run the Sansamp’s 1/4″ output straight to the amplifier, I’ve found that I get a cleaner and much stronger signal through the backwards DI box. The DI also deals with the ground-loop problem mentioned above. 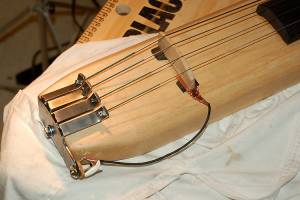 There are quite a few DIY folks out there who have done a lot of interesting things with instrument amplification. Just type something like “piezo impedance circuit” into Google and you’ll be swamped with information. Although I tend to use amps with high-impedance inputs designed for acoustic instruments, I may build an impedance-matching buffer preamp in the near future anyway – perhaps something like the Mint Box Buffer. This photo shows the nut with rough-carved grooves that hold the strings in place. I need to do some more filing and shaping here, but it does do what it’s supposed to. 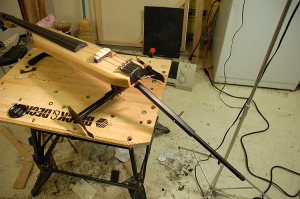 By the way, a cello is tuned C-G-D-A. The C string (thick one, leftmost), is sitting a little high and needs a less extreme angle on its way to the tuner post, so I’ll have to break out a wider file. Another view of the nut. 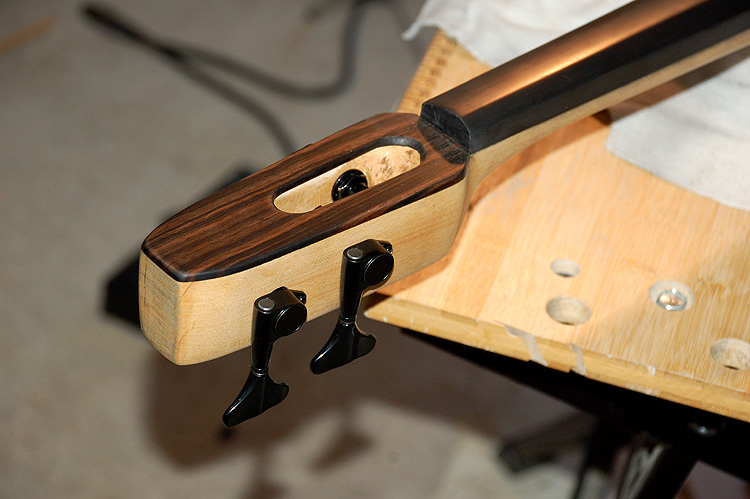 The tuners, by the way, are positioned so that each string can make its way from the nut to the tuning post without running into anything else. 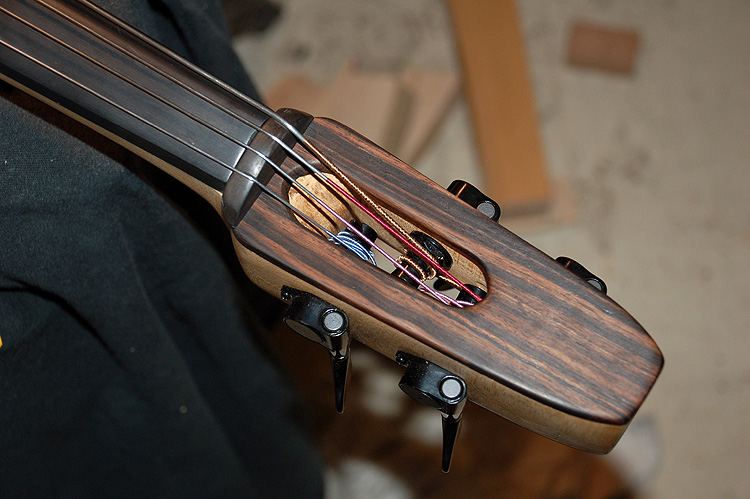 Pending: finishing on tailpiece, the real piezo pickup, end pin brace. 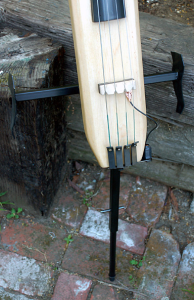 The instrument is shaped like a cricket bat with strings. It’s playable, but without some sort of bracing system to hold it at the proper position and angle, the player would be a hunchback in a week. 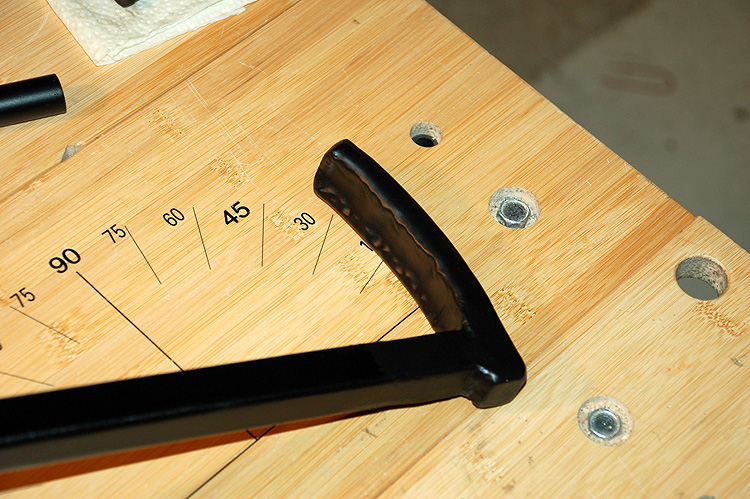 Hold the the instrument at a position and angle that will imitate the dimensions of a real cello. 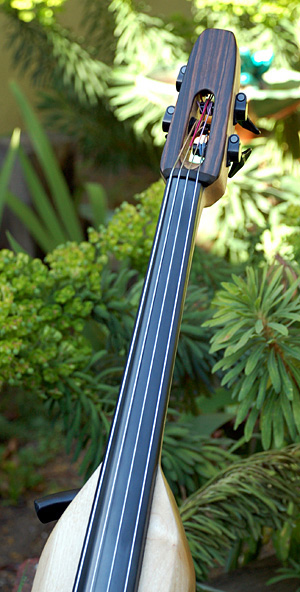 Provide the three contact points where a real cello touches the player’s body: upper chest, and insides of both knees. 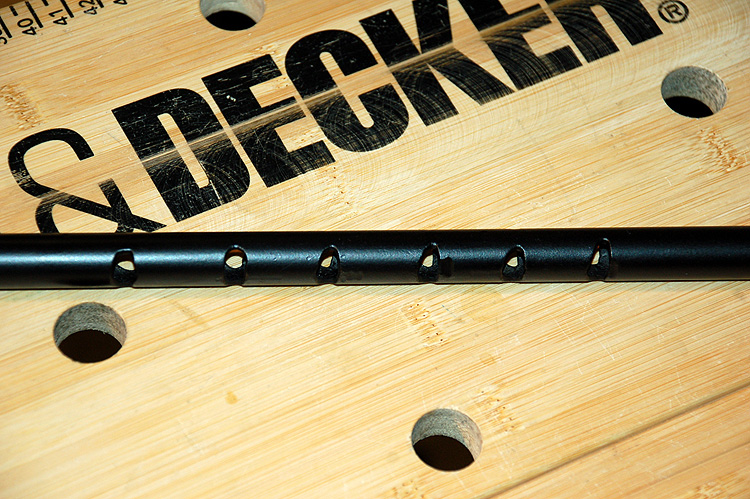 Have an end pin of adjustable length that touches the floor. Be detachable and modular so that it will fit into a carrying case along with the instrument. Be relatively strong and rigid. I used to have a link here to the late, great Mstislav Rostropovich playing cello at Checkpoint Charlie when the Berlin Wall came down, but I don’t know what happened to it. It shows the endpin I modeled this one on. 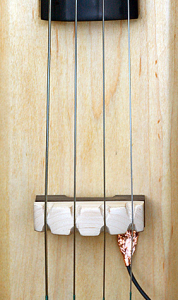 Most cello endpins extend parallel to the plane of the instrument. Note the angle of the endpin in the photo. It’s decidedly not parallel to the plane of the instrument. Rostropovich was notorious for this construction tweak, which was considered unusual. Here at Hallenbeck Labs, we consider it good and will emulate it, for reasons discussed below. From the front, the brace is cross-shaped. 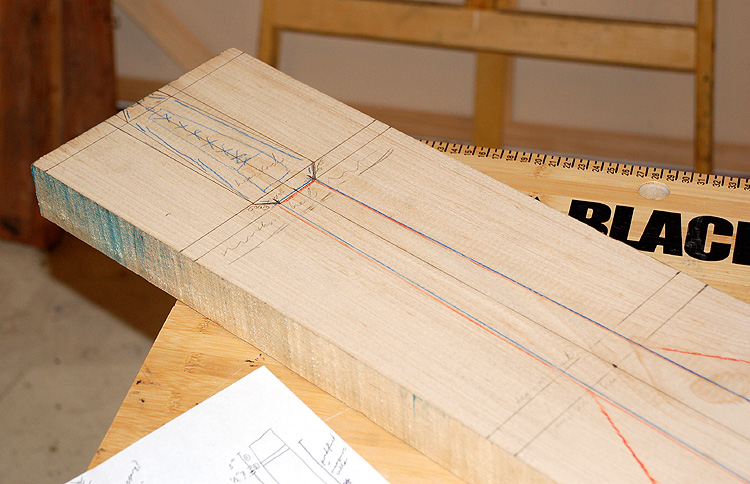 The vertical section (middle in photo) aligns with the body of the instrument. The crosspiece (bottom in photo) bolts to the vertical section at a 90-degree angle. The end pin (top in the photo) slots into the bottom of the vertical section. The vertical section is angled back at the top and the bottom to provide contact points in the proper positions. The piece that looks like a cane handle at top of the vertical section is shaped roughly to the dimensions of the back of a real cello at the neck heel, where the instrument rests against the player’s upper chest. 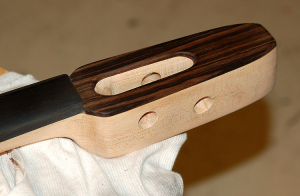 The bottom of the vertical section is angled back to simulate the way a real cello balances on its end pin. 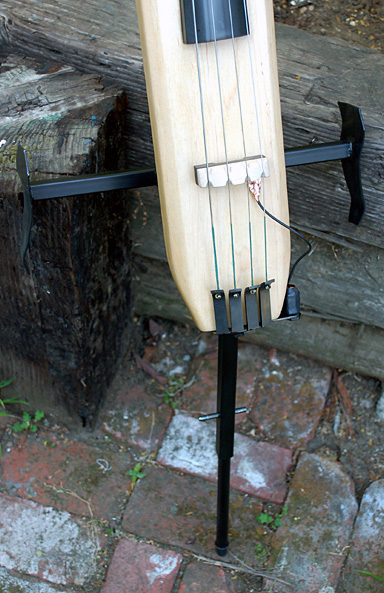 Below left: the part that sits against the player’s chest, behind the instrument. Below right: one of the pieces that sits near the inside of the player’s knee. The brace section bolts to the back of the instrument and is of course removable. 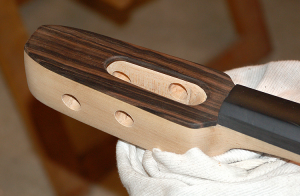 The sleeve on the bottom side of the instrument is for the tailpiece. Above right: this award-winning shot shows the instrument mounted on the brace. 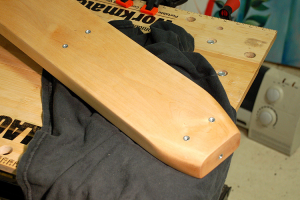 The vertical section is bolted to the back – note the curved piece peeking out behind the top section of the body and upper left. The crosspiece section is bolted to the vertical section. The endpin slides inside the lower end of the vertical section and is held in place by the set pin. Better photos of the brace later… after I clean up the huge mess I’ve made in the basement. The final tweak to the brace will be rubber or foam of some sort over the parts that make contact with the player’s body. This is the tailpiece after I applied a blackener solution. I use a room-temperature gel called Tool-Black made by somebody named Precision Brand. The stuff is kind of expensive so I have to be judicious about how I use it. I figured this was worth it. 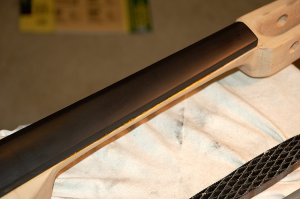 After applying the blackener, I wiped the tailpiece down with a rust sealant. Above: tailpiece, brand-spankin’-new transducer, and brand-spankin’-new bridge. This transducer uses a Neutrik 1/4-inch phono jack and also has a ground wire because the Neutrik jack has a plastic (not metal) casing. I shielded the jack with copper foil tape just like the piezo end. Since the jack’s shielding makes contact with both the jack’s ground terminal and the tailpiece, the ground wire isn’t really necessary, but I thought it would be good to have in case the shielding gets munched. Eventually, I’ll replace the alligator clip on the end of the ground wire with something less unsightly. I had to move the piezo tab of the transducer around for about an hour to find the best position for it. 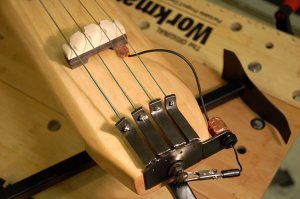 Placement is very important for a piezo pickup – moving it a couple of millimeters can radically alter the signal it sends to an amplifier. Between the ebony piece and the body, under the D and A strings, the response is strong and even all across all four strings. Beats me why that’s the sweet spot, but anything piezo-related is funny that way. Above: another view of the bridge. It’s probably too thick and I may swap it out with something better in the future… but it seems to work and I’ll keep it for now to see how it goes. 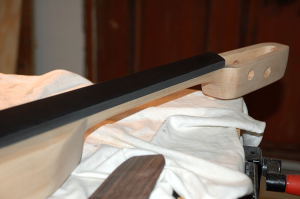 I made the bridge a two-piece assembly (maple upper, ebony lower) to maxmize the number of possible positions for the piezo film tab, which can be positioned between the ebony piece and the body, or somewhere between the upper and lower pieces, which are not glued together. 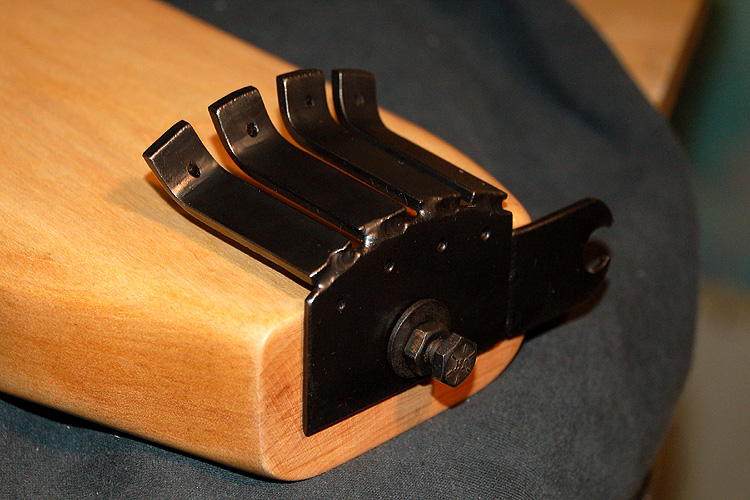 The ebony piece has feet to reduce interaction with the body, and is notched on the top of both short sides to allow the piezo tab to be inserted parallel to the bridge, if necessary, without damage to the contact plugs at the end of the tab. 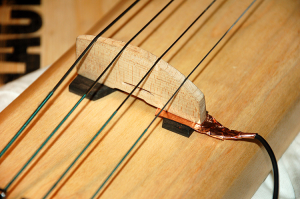 The bridge assembly is not glued or fastened to the body in any way – it’s held in place only by the tension of the strings. 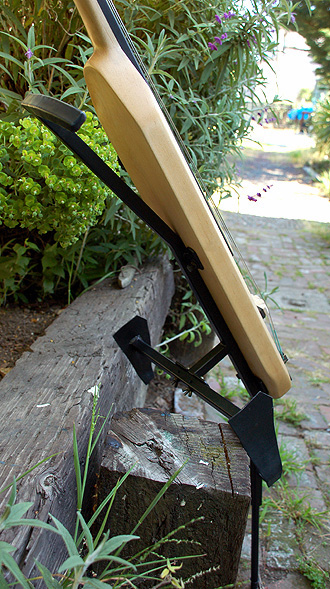 For bowed strings and mandolin-style instruments, that’s how you want it. 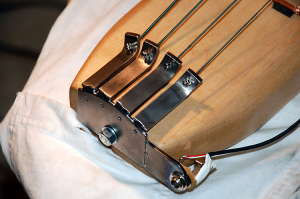 Fixing the bridge in place would be bad because it would prevent any adjustments for intonation (unless the bridge were to have moveable string mounts, like a Gibson Les Paul bridge). Since I wound up placing the piezo tab under the foot of the lower piece, I didn’t really need to make the bridge a two-piece mousetrap. But I’m glad I did, because I learned a lot about how (not) to do it next time. Actually, it’s been done for now for a couple of weeks. The only real change is that I put shrink tubing around the pickup jack. Above: tailpiece and transducer jack. As it turns out, the ground wire isn’t really necessary, because 1) the copper foil is making contact with the tailpiece, and 2) the shielding seems to have been a lot more effective than I thought it would be. Recorded April 19, 2008, Oakland CA, in ProTools 7.3.1 on a G5 iMac. I ran the cello pickup through a Fishman Pro-EQ II preamp directly into an MBox, to see how clear a signal I could conjure. It fared pretty well in my humble opinion. C-major scales/arpeggios. Demonstrates the full pitch range of the instrument (except for extreme highs on the A string). Bass line that fits “King of the Road.” Demonstrates the pizzicato (plucked) tone. “Blue Moon of Kentucky,” more or less, with two tracks panned left and right. Piezo transducers aren’t really meant for direct console input – they’re more for playing live, for bowed instruments, anyway. Consequently, these sound clips have a weird, cheesy, old-synthesizer tone one might hear at, say, the public hanging of Bubbles the Clown. 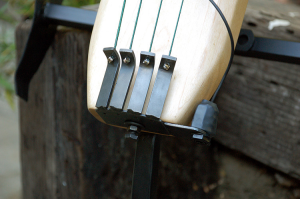 Lately, I’ve had the cello chompin’ happily through a standard bass amplifier and it sounds a whole lot better than the clips above, with much less of the “Clown Must Die” tone.